Marina Proposed - 1986 saw the Local Authority seriously looking at proposals to turn a huge section of the seafront into a Marina. Not just a boating proposal, but a whole land reclamation project that would have seen a huge island of some 750 acres, to the east of the pier, just off-shore towards the pier head. On it would have been built a gold course and many other leisure facilities as well residential developments. The proposal would have been called the Southend Island Marina. Royal Visit - Little did HRH Princess Anne know what was going to happen in just over a months time, but on 2nd May 1986 she inaugurated the new pier railway service. BBC Essex Arrives - A new radio station started broadcasting on 5th November 1986. BBC Essex switches on, breaking the convention of BBC names by dropping 'Radio' in the title, to avoid confusion with Essex Radio. Southend's transmitter is atop of Maitland House. The Pier is Sliced in Two - The MV Kingsabbey sliced through the Pier between the old and new Pier Heads on 30th June 1986. Not great timing with the height of the season just around the corner. But as tends to be with the pier calamities they in themselves become an attraction that brings the public out to support the old strcuture. 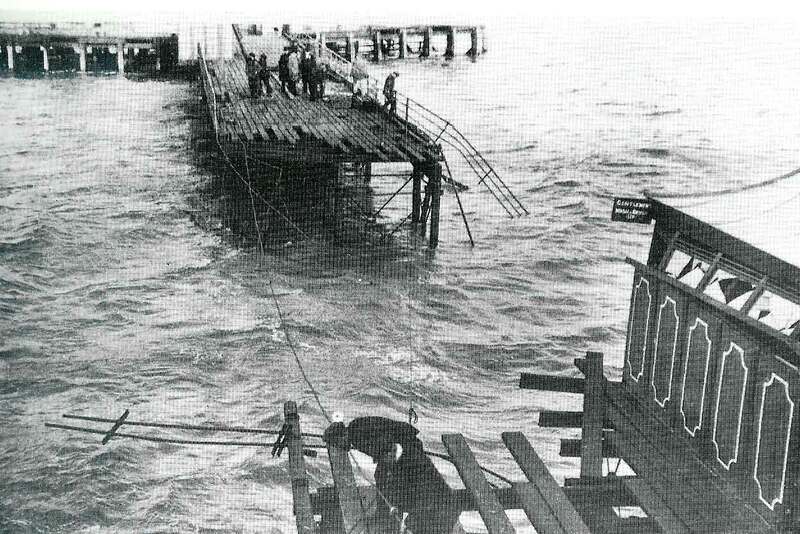 This time the tanker severed the lifeboat slipway, caused irreparable damage to the boathouse and left a 70ft gap in the Pier. Repairs followed in 1989, with a new café and toilets opening on the stem extension. Is this Love? - Alison Moyet, formerly of 80's pop band Yazoo and later becoming a very successful solo performer and long term fan of Southend United, videoed her Chart Hit 'Is this Love?' at Roots Hall. A later hit 'Blue' was a tribute to her much loved soccer team. She can still today be seen in th West Stand for the occasional home game. New Manager - In June a new manager walked through the doors at Roota Hall who would have long term relationship with the club. David Webb who managed the Shrimpers until March 1987, would depart then return in December 1988 for what could be considered the most successful management period in the club's history until 1992. Even to today Webb has maintained a close link and is still called upon for help when needed. Kursaal Buildings Close - After 85 years the famous Kursaal building closed its doors. It took another 12 years before they could reopen in a blaze of glory in 1998. JH Jacks Ltd Closes Up - One of the towns's more significant clothing manufacturers closed this year, located close to the junction of Seaforth Avenue and North Road in Southchurch. It opened in 1932 manufacturing shirts and pyjamas. During the war it turned its skills to RAF clothing and 'demob' suits as well as clothing for Russian children. By the time it closed it was producing shirts for MArks and Spencer as well as childrens items for Mothercare. Cannon in Alexandra Street - The ABC changed hands once again, this time to Cannon. Who remained in control until the cinema finally closed down. To eventually become the New Empire Theatre. The theatre today is empty, but rumours are afoot that it could return as a cinema or theatre. An Eastender Turns on Southend's Illuminations - The Southend Carnival in 1986 was attended by celebrity Wendy Richard who switched on the illuminations. Well known for her appearance in 'Are You Being Served' as Miss Brahm's and more recently in Eastenders the new soap on the block. She spoke to the Echo and mentioned she enjoyed coming back to Southend more recently because Eastenders was filming one of there many trips to the seaside, and also when she as a girl lived for a while in the town during the 50's. She reminisced that she still has a scar from her time falling off a ride at the Kursaal Amusement Park.